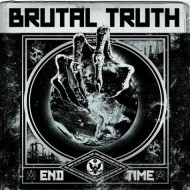 BRUTAL TRUTH didn't just return to the convoluted scene with the amazing "Evolution Through Revolution". They knocked it flat on its back, stomped it to smithereens, and left a trail of sweet smelling smoke and a wave of maniacal laughter. There is grindcore and then there is BRUTAL TRUTH. "End Time" proves it yet again, a point that is without valid contrarian argument. By the same token, there is psychosis and then there is BRUTAL TRUTH. 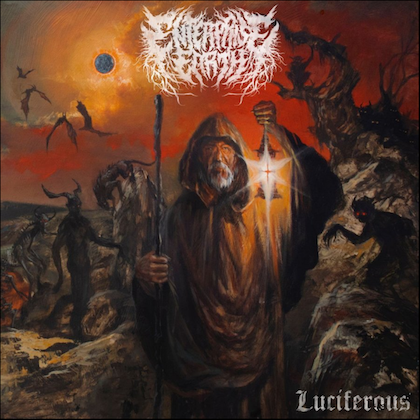 Like the grind equivalent to straight jacketed lunacy, a title like "End Time" couldn't be more appropriate to the 23 tracks of what may seem like chaos until one realizes the diabolical purposefulness of BRUTAL TRUTH's design. The term "frantic" only scratches the surface of what's in store on "End Time". Kevin Sharp preaches from on high in the finest demented form, somehow supported through the shifting contours of Rich Hoak's scatter blasts and twisted rhythms, Erik Burke's half-man/half-beast riffs, and those nausea-inducing bass swirls of Dan Lilker that are so integral to the attack. Gravity is defied and the applicability of reason is futile. That the four are able to move in unison through pockets of direct pummel that within seconds implode and deconstruct attests to the group's unbelievable chemistry and single mindedness of purpose. 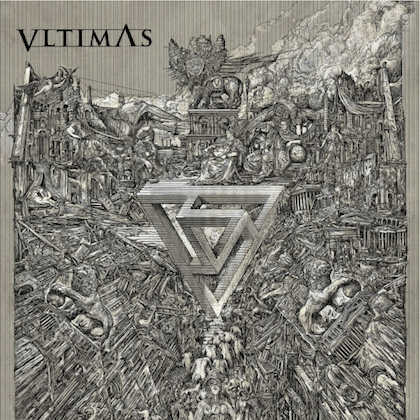 For every minute of traumatic grind — let's go with the early album nuttiness of "Simple Math" — there are equal amounts of crawling brain-melt, whether the surging abrasiveness of "Malice" or the atonal slither of "Drink Up". And yet songs such as "Small Talk" with its burst of crazy d-beat gallop and the frenzied dynamics of the title track are far more memorable than the average grindcore blurring of lines. Memorable as in catchy? Not quite; more like memorable in a way similar to the fascination experienced by rubbernecking bystanders witnessing a continual series of car wrecks. By the time you've reached 15-minute feedback finale "Control Room" all that's left to do is sit with head in hands and sob uncontrollably. The only way to survive "End Time" is to brace yourself, slam your eyelids shut, and hold on tight for a white-knuckled ride through an asylum that makes the one from "One Flew Over the Cucko's Nest" seem like a cruise on the Love Boat. This is the sound of blissful disequilibrium. This is BRUTAL TRUTH. Count on it.